A slash burning pile on the Dillon Ranger District last year. 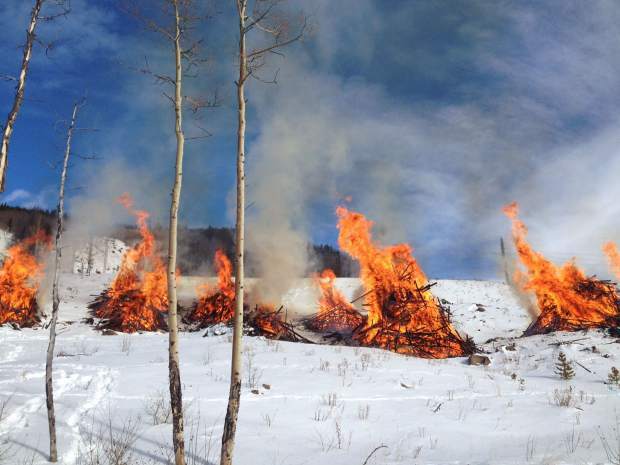 Fire managers from the Upper Colorado Interagency Fire and Aviation Management Unit are taking advantage of the changing weather this season to burn slash piles from fuels reduction and hazardous tree removal projects. The burning will take place at several locations across the Dillon and Eagle-Holy Cross Ranger districts on the White River National Forest located in Summit and Eagle counties. Slash piles are created in project areas where other means of disposal aren’t feasible due to steep slopes and lack of access. Projects were conducted for hazardous fuel reductions in the wildland urban interface to improve wildlife habitat, reduce the risk of wildfires and to give firefighters safer locations to defend homes and communities. In Summit County, burns will be located at the Highlands subdivision in Breckenridge, near Tiger Road and Highway 9, Swan Mountain Road, Keystone Gulch and Montezuma Road. Additionally, the Arapahoe Basin Ski Area will be conducting slash pile burning as conditions allow over the next month. Fire crews may burn ten or hundreds of piles per day, though there is no certain timetable for when the burns will happen. Fire specialists will wait until smoke dispersion conditions are optimal for a safe and effective burn. Officials are warning that while smoke from the burns will dissipate during the day, nighttime smoke may remain in valley bottoms slightly longer.